You have left the pages of Four new joiners at Perspective (North East) Ltd. If you would like more information about which areas of Perspective's website contain regulated content and about these notifications, please click here. 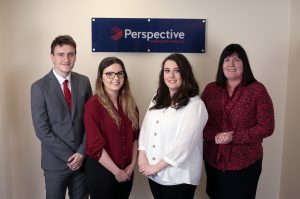 Perspective (North East) Ltd, the Newcastle office of national financial planners and wealth managers Perspective Financial Group Ltd, has recruited four new people to its team. Julie Hunter, a Financial Planning Consultant joins from Galloway Whitfield (Life & Pensions) Ltd following its acquisition by Perspective Financial Group last month. Julie has over 30 years’ experience in the sector, specialising in corporate clients, and advising on pensions, business protection and employee benefits. Rochelle Mills and Charlotte Hudson join as Administrators from the retail and telecoms sectors respectively. Ian Wilkinson, Managing Director of Perspective Financial Group commented: “I’m delighted to welcome these new staff members. We are on a strong growth trajectory both in the region and nationally, having already made two further acquisitions this year with more to come. Perspective Financial Group Ltd employs over 160 staff across 14 offices in the UK. Perspective’s Group offices provide a range of financial planning and wealth management services to private individuals, businesses and trusts. Perspective (North East) Ltd, based in Newcastle upon Tyne, has over 40 staff and holds the highly regarded Chartered status from the Chartered Insurance Institute. Perspective’s aim is to become the leading provider of financial planning and wealth management advice in the UK. Its focus is on the provision of quality advice and providing a fully-rounded and robust proposition for all its clients. Perspective has been ranked in the FT’s Top 100 Financial Advisers league table since 2011. Perspective was launched in April 2008 as a consolidation vehicle within the financial services industry. It has now grown to be one of the largest, whole of market financial planning & wealth management businesses in the UK.